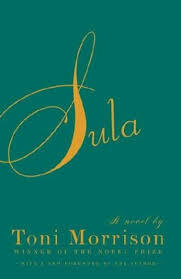 Sula essays discuss the character Sula from Toni Morrison's 1973 novel Sula. The character Sula in Toni Morrison’s 1973 novel "Sula" is one half of a friendship that is strained by tragedy. Sula is the daughter of Hannah and granddaughter of Eva. Both women are considered loose by town standards, and Eva runs a boisterous boarding house. This is the atmosphere where Sula grows up. Sula has one distinguishing characteristic: a birthmark over one of her eyes. To some people, it looks like a rose; to others it looks like a snake. The birthmark is a physical manifestation of the concept of good and evil. Indeed, how various characters interpret the birthmark speaks more about them then it does Sula. There are many characters in the book who come to see Sula as evil, including her best friend Nel. Sula’s unconventional lifestyle, including her numerous affairs, are condemned by residents of the Bottom, yet she carries about herself a kind of freedom. She refuses to follow convention, and the townspeople come to resent her because she exposes the shallowness of their own, conventional lives. Sula is not evil even though Nel paints her as the evil one in their relationship, further alienating the two. Rather, Sula is a free-spirited, uncompromising protagonist. In living her life on her own terms, Sula remains true to her identity, unlike many residents of the Bottom, who are resigned to settling for what is safe. African American Experience Research Paper studies female authors such as Toni Morrison, Alice Walker, and Zora Neal Hurston. Literary Characters research papers overview characters and how they are a necessary catalysts that drive a story to it’s ultimate potential. Afro-American Studies Research Papers on an interdisciplinary field of research and writing that focuses on politics, cultures, and histories of African American people. Paper Masters writes custom essays on Sula and discuss the character Sula from Toni Morrison's 1973 novel Sula.